You have the ring, the venue and the date all picked out. Now, the only thing left to do is head to a busy department store and start creating your wedding registry—right? These days, brides and grooms are just as likely to open up their laptop as they are to drive to a brick-and-mortar retailer when it comes time to create the perfect registry. If you're in the throes of wedding planning, the sheer number of online registry sites may overwhelm you. Whether you want to ask your guests for physical gifts or a donation to your favorite cause, we've rounded up some of the most popular choices online, along with the pros and cons of each. If you've been to a wedding recently, you've probably come across Zola. 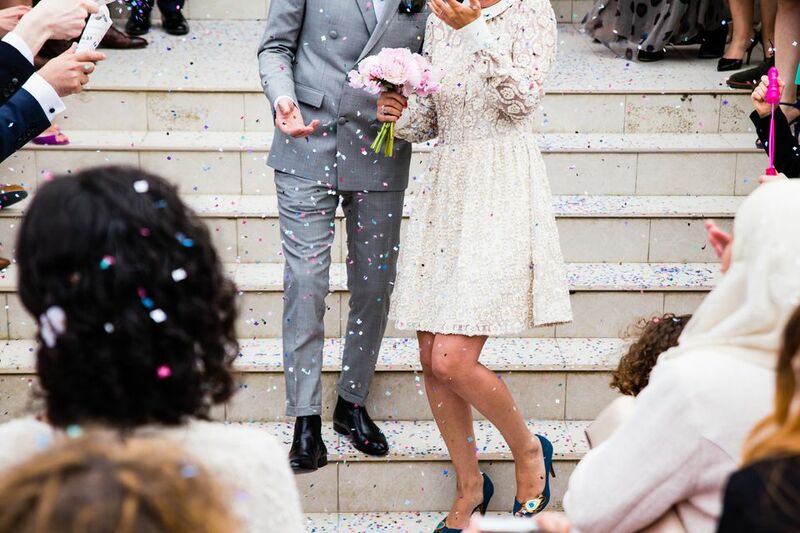 This fast-growing startup recently received a whopping $100M in funding and is quickly becoming one of the most popular choices for brides and grooms. Aesthetically pleasing display that's user-friendly and geared toward the modern couple. You can add gifts from both Zola (which has over 450+ brands) and other retailers. Install a Chrome extension and easily add items to your registry wherever you're browsing. Fast, (mostly) free shipping. Though some larger items have additional fees for delivery, most of your gifts ship to you entirely free. Items don't ship until you say so. If you change your mind at that time, you can transfer Zola purchases into credits that you can use for anything else on the site. Zola offers a 20% completion discount to buy anything left on your registry. Eyeing an expensive gift? Allow your guests to split up the cost and purchase a portion of the overall cost. Zola will deduct a 2.5% processing fee for any cash gifts made through the site. You may find fewer well-known brands than you'd find on other registries. Because many of the gifts are niche and curated, it's not uncommon for them to go out of stock before you ship them. Returns are allowed, but they must be shipped back to Zola because there is no physical store. Overall, Zola is a popular choice for many modern brides. If you are searching for a great online registry that can sync with a wedding website, guest list and more, check out Zola. If you already use Amazon for nearly everything else, you're probably considering using their wedding registry as well. Of course, you want wedding planning to be as simple as possible, so using a retailer you already frequent may be the easiest option for you. Amazon offers extensive gift options. If the traditional wedding china or mixing bowl isn't for you, you can think outside the box and add whatever you want to your Amazon registry (if you want to add a sweater for your dog, we won't judge you!). Their customer service is excellent. If you've ever used Amazon and had to contact their customer service department, you already know how responsive and accommodating they are. Your friends with Prime can quickly ship your gift to you for free, even last-minute. Most products you pick will have countless reviews, so you'll know what you're getting ahead of time. If you add gifts from other retailers, guests will be directed to those sites to purchase rather than staying in-site. Though you can ask for Amazon gift cards, guests cannot give you cash or donate to your honeymoon fund through Amazon, limiting you to mainly physical gifts. Any return has to be done through the mail within 180 days. If you are an avid Amazon user, it may make sense to create your wedding registry with a site you (and your loved ones!) already know and trust. Though Target isn't a purely online registry, many engaged couples create a registry on the popular retailer's site without ever setting foot into a physical store. Target has nearly 2,000 physical locations, so your guests can decide to buy online or in-person. Plus, you can easily return gifts to the store if you change your mind. You'll get a whopping one-year return period on any gift you're given. Any gift over $100 qualifies for group gifting, so your ​guests can all put a little into that fancy blender you've been coveting. Though Target offers a handful of curated, designer home decor lines such as Hearth & Hand, you'll be more limited on options than you would on, say, Zola. They offer a slightly lower completion discount than other sites ($15). Items ship immediately, which can be a hassle if you're away for your wedding when a guest buys you a gift. If you are a frequent Target shopper and you're a big fan of their offerings, it's a great choice for your wedding registry. Blueprint is a universal registry that's been around since 2013. Similar to Zola, it allows you to add gifts from various retailers all in one place. The biggest perk of Blueprint is the "picture it in your room" feature. This feature allows you to digitally position an item in your room before you buy. This can be a great benefit if you're registering for furniture or large items. You can select from 50+ retailers all in one place, so your guests don't have to hunt various sites for your choices. Like Zola, Blueprint allows for group gifting and cash gifts. You can even ask guests to help fund parts of your wedding (for example, asking guests to chip in for a donut food truck). Blueprint subsidizes credit card fees, so unlike other cash gift sites, your guests won't be subject to a 2.5% fee when they give you cash. Blueprint isn't as widely known as some of the other big sites so your guests may not automatically check for your registry. The registry site doesn't offer a wedding website or guest list integration. Gifts need to be returned to the original retailer, so you'll have to keep track of where your gifts came from. If you need cash over gifts, but still want to offer a registry, then Blueprint may be a great choice for you. Like Target, Bed, Bath & Beyond isn't solely an online retailer, but their registries are so popular that they transcend their brick-and-mortar status. Bed, Bath & Beyond has over 1,500 physical locations, so your non-tech savvy guests can head to a store to pick out a gift. You get an entire year to make returns, so you don't have to rush around after the wedding if you change your mind. The site offers a great experience, and it's easy to use and find products. Your guests probably have a stash of those​ ubiquitous 20% coupons at the ready, so they can save money on your gift. You'll be faced with a smaller selection of gifts, as Bed, Bath & Beyond doesn't offer a universal registry. Gifts ship as soon as they're purchased. Bed, Bath & Beyond registries are popular for a reason. It is a great choice if you plan to add primarily kitchen and home goods to your registry. Honeyfund has quickly risen in popularity over the past few years because it offers brides and grooms a unique way to ask for what many of them really want—cash. Allows couples to register for "experiences" for their honeymoon. Ask guests to contribute to airfare, dinners out, hotel stays and more. The gift is given to you as a general cash contribution. There are no fees added to your guests' gift. You can write around each gift, telling your guests what you plan to do on your honeymoon and how their gift makes it possible. Honeyfund is great for couples who want only cash gifts, but there are no physical gifts attached to the site. Some guests may find explicitly asking for cash to be unorthodox and would rather give you a physical wedding gift. You'll pay up to 3% transaction fees to receive your gift. Honeyfund can be a great option for those couples who have everything they need at home, but still want to include a registry for their guests. Is There a Polite Way to Ask for Money Instead of Wedding Gifts?